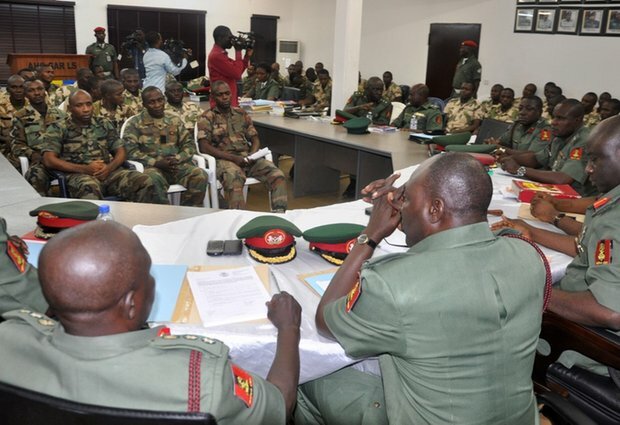 LAGOS, NIGERIA (AP) — Nigeria's army is reviewing the courts-martial of more than 600 soldiers and officers, including dozens condemned to death for allegedly deserting the battle against Islamic extremists, according to an order received by The Associated Press on Sunday. The review comes three months after the inauguration of President Muhammadu Buhari, who has vowed to crush the Boko Haram Islamic uprising which has spilled across Nigeria's borders. An order signed by army administrator Maj. Gen. A. B. Abubakar and dated July 31 requires all accused and condemned soldiers to appear in northern Kaduna city before a committee sitting Aug. 7 to Aug. 24 "to screen and assess all disciplinary cases arising from erstwhile Op Zaman Lafiya" against Boko Haram. Seventy-two soldiers were condemned to death by three courts-martial last year for alleged cowardice, mutiny, aiding the enemy and other charges. Another 579 are before ongoing courts-martial. Human rights lawyer Femi Falana has called the trials "a travesty" held in secret because the soldiers' evidence is a condemnation of Nigeria's military establishment — indicating corrupt officers often divert money meant for salaries and arms. Soldiers have described being sent into battle with no rations and just 30 bullets each, and fleeing when their ammunition runs out. Falana said the army was making scapegoats of inexperienced soldiers — his clients were aged between 21 and 25. Buhari also has said that "our military was not sufficiently supported or equipped." Air Chief Marshal Alex Badeh, the defense chief fired when Buhari got rid of the top echelon of Nigeria's military last month, complained last week that "fifth columnists" in the military have leaked operational plans to Boko Haram. Amnesty International has accused Nigeria's military of the deaths in custody of 800 detainees. Associated Press writer Bashir Adigun contributed to this report from Abuja, Nigeria.